Select Tsum Tsums still Buy 2, Get 1 FREE Online from Disney Store! 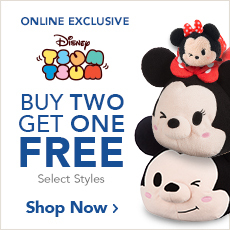 Home » News » Select Tsum Tsums still Buy 2, Get 1 FREE Online from Disney Store! Disney Store continues it’s Tsum Tsum special online at Disneystore.com. Select Tsum Tsums are Buy 2, Get 1 Free. Some highlights of the sale including the newly released Polka Dot Mickey and Friends series, the Beauty and the Beast Bag Set, select mediums, and select larges. Click on the link or photos below and be sure to pick up a great deal on Tsum Tsums from Disneystore.com.